PRIVATE INVESTORS 246 • SHOPPING CENTER BUSINESS • May 2018 I ndividual investors comprise the larg- est ownership group in the net lease sector. 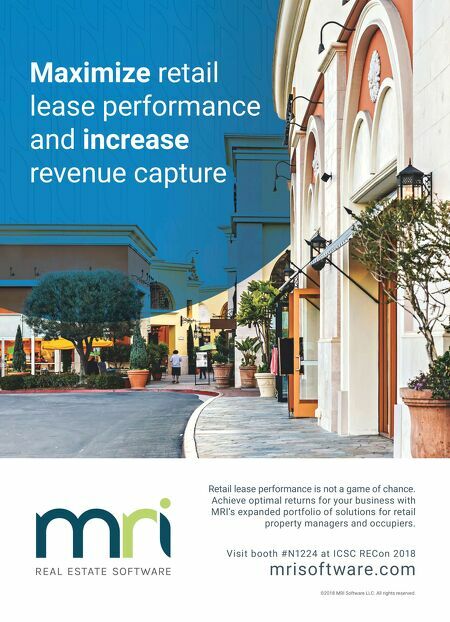 Due to the passive nature of net lease property investments, it can be easy for an owner to have the property be out of sight, out of mind as long as rents continue to roll in and cash continues to flow. Shopping Center Business recent- ly interviewed Mario Brunelli, investment sales specialist with Old Bridge, New Jer- sey-based R.J. Brunelli & Co., who works with a number of individual investors. We wanted to find out what investors should be paying attention to, and what indica- tors they should look for when it's time to sell or trade. SCB : What market conditions should tip a single-tenant net lease property owner that value (equity) has been created in his/ her property? MARIO BRUNELLI : There are a number of market conditions that will cause the value of someone's property to rise. For one thing, when interest rates drop, cap rates will slowly decline, triggering an increase in property value. Landlords should consider selling the property if interest rates are on the rise. Of course, positive or negative changes to the site's local economy (e.g., the addition or clos- ing of a major employer) can impact re- tail property values. Similarly, the value of a single-tenant retail property might decrease if, for example, a neighboring shopping mall shuts down. Additionally, proposed government policies and new tax rules could have a positive or nega- tive effect on the value of the property. Finally, changes to the property's prima- ry roadway could affect the value of the property. For example, a proposal to di- vide the site's highway might hurt business by making access more difficult for your tenant's customers. SCB : Do many private party — individual — net lease owners inadvertently ignore the equity in their properties because they keep seeing cash flow? BRUNELLI : Yes, they believe they won't be able to find a higher return on a replace- ment property. Some investors do not un- derstand the power of leverage. Investors can become complacent, with no sense of urgency about making an effort to find a replacement property with a higher rate of return. SCB : What fears do net lease owners have about 'trading up' to new properties? BRUNELLI : Sometimes they're afraid they won't be able to find a property that is in a better location. Some also have concerns about whether they will be able to find a property within the timeframe needed in a 1031 exchange. Fear of rising interest rates — of not being able to get financing at a rate that makes economic sense — can also be a factor. Yet another fear can be the complications that typically arise in an investment transaction. However, if the net lease owner works with a broker highly experienced in investment sales transactions, most of these concerns would be mitigated. SCB : Are buyers concerned about geo- graphic location of the property — the distance from their place of residence? Should they be? How can investors over- come this concern? BRUNELLI : It's an appropriate concern if you're not buying a triple net lease (NNN) property. Remember, the tenant maintains the property on a triple net lease. Know- ing this, any experienced commercial real estate broker representing the buyer will advise that owning a single-tenant, NNN property in another state should not re- quire periodic inspection. On the other hand, human nature is what it is. Over the years, we've learned that most investors would like to buy properties that they can easily visit from time to time. N o n e t h e l e s s , there has been and will continue to be a very strong interest among investors for sites in states with no income tax. This has been a factor in spurring real estate in- vestments in states such as Florida, Texas, Nevada, Washington, South Dakota and Alaska. 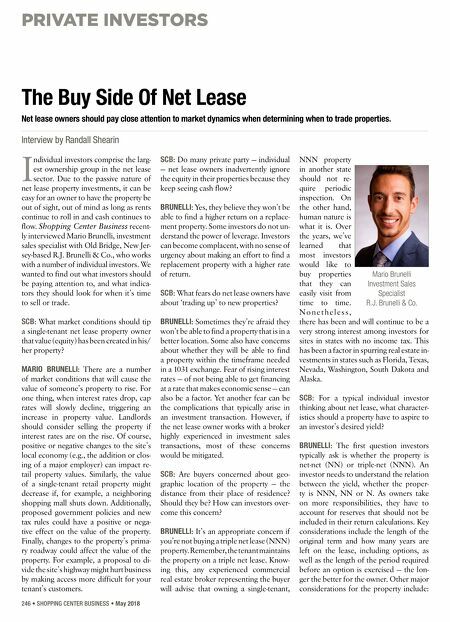 SCB : For a typical individual investor thinking about net lease, what character- istics should a property have to aspire to an investor's desired yield? BRUNELLI : The first question investors typically ask is whether the property is net-net (NN) or triple-net (NNN). An investor needs to understand the relation between the yield, whether the proper- ty is NNN, NN or N. As owners take on more responsibilities, they have to account for reserves that should not be included in their return calculations. Key considerations include the length of the original term and how many years are left on the lease, including options, as well as the length of the period required before an option is exercised — the lon- ger the better for the owner. Other major considerations for the property include: The Buy Side Of Net Lease Net lease owners should pay close attention to market dynamics when determining when to trade properties. Interview by Randall Shearin Mario Brunelli Investment Sales Specialist R.J. Brunelli & Co.